Rarely venous emboli arise from pelvic veins, inferior venacava or else where. Some special types of venous emboli. It refers to "large snake like venous embolus that becomes coiled upon itself and impinges on bifurcation of main pulmonary artery and sits astride the two major subdivisions of pulmonary artery. 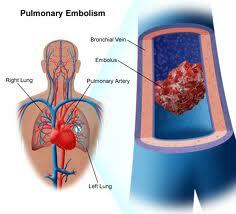 such embolus is very dangerous and may cause pulmonary infarction. there is a point to be noted here that lungs also get partial blood supply from bronchial arteries which are branches of aorta hence, complete occlusion of pulmonary artery is needed to cause pulmonary infarction. It refers to a venous embolus that enters from right side of the heart to the left side of the heart by passing through an intra-atrial or intra-ventricular defect and gains entry into the arterial system. such embolus is more dangerous than simple venous embolus because it may block larger arteries and may cause massive ischemia, infarction or heart failure. 4. fragmentation of vegetations on heart valve. Arterial emboli follow a shorter course because they travel through the vessels of progressively decreasing diameter, finally lodge in a vessel of smaller diameter than this emboli cause infarction of the organ supplied. for example, if emboli enters into coronary artery, it causes myocardial infarction, similarly occlusion of cerebral artery will cause cerebral infarction.